Today is the start of the event at Willy-Brandt-Platz. We hope that the weather gods will have mercy and keep most of the predicted rain showers away! Die vier Musiker aus Simbabwe (Fungai Nengare, Munya Nyamarebvu, Prayersoul und Tendai Madzviti) , die derzeit Gäste der Villa Waldberta sind und bereits mit viel Erfolg in den letzten Wochen in München an verschiedenen Plätzen aufgetreten sind, stellen sich musikalisch vor. Umweltprojekt mit jutebeute-Kreativwerkstatt, Infostand und weiteren Aktionen von update.jung & erwachsen, Münchner Stadtbibliothek und PA/Spielkultur. e.V. Hier wird gezeigt, was Münchens „coole“ Skater mit und aus der Nomadic Sculpture machen können. How does it feel to be a Nomadic Sculpturer? by Tuncay Filed under: Nomadic Sculpture,Statements,What's The Deal? generalComments Off on How does it feel to be a Nomadic Sculpturer? 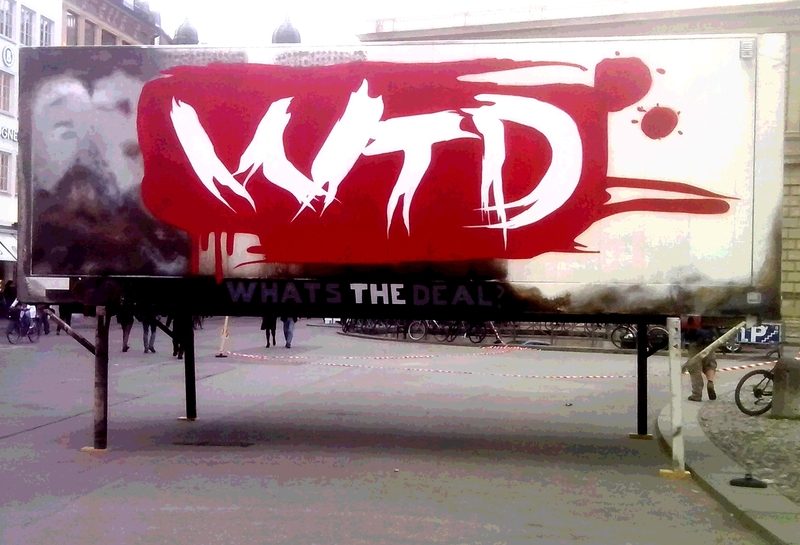 WTD Nomadic Sculpture Episode II – Candidplatz 2014 from What’s the deal? on Vimeo. This quote straightened me up. It’s so true and everyone for shure knows this – wether you believe it or not: in the deepest part of our human consciousnes we know this! It were always the few curagious people who changed things. Sometimes it were maniacs who once leaded (or still lead) a change also in a very cruesome and unhuman way, but it always were a few. When you accomplish such a project, you are confronted with many interesting reactions. In this neoliberal phase of human history you are confronted with a lot of sceptic critics, immediately when you get active to implement a new idea that bases on “sustainability”. a lot of people mention, that no one can hear this word anymore. I think it is because there is no place in here for a authentic idealistic thought. Idealistic thoughts are used for representative purposes. If this is not your priority you will get funny reactions. You know why? Because you mean it! And if you mean it then you will be willing to change the priorities of this society. What is the priority of this society? The moment i ask this question the reader has it already in mind so i don’t even have to spell it. You see? If you are serious with your idealistic thoughts you become a dangerous element for all those who just are content with complaining about this crazy world and with claiming that they can’t understand why it is so. But in the meantime most of us accept the defaults which are given by this postmodern society and feel the duty to accord to them everday. For example: accepting money as a undispensible element of our daily life and obey the rules which i have to accept if i want to achieve a moneybased wealthy life. So we all have to accept that we all are part of global destruction. The European Union which gives us the support to accomplish this wonderful project for example is based on an economical system which accords strictly to the rules of a global money market. And Europe is a wealthy continent. So it is kind of normal that a lot of europeans would not even think about changing this system. Why should we? We live in a region where most inhabitants of this world would love to live! Thousands and thousands of people risk their lives to reach this peace of earth, where the fundamentals where drawn for the success of a harsh economical system which is known as material based. But if you look at the developement of the global markets you soon will realize that it looses any logical and resumable connection to reality and so on and so on… i don’t want to bore you with this issue. Tehre is enough Literature you can read about this (for example Noam Chomsky: “Profit over People, Neoliberalism and Global Order”, Seven Stories Press, New York 1999). You may ask now (and this is a question i read in the eyes of a lot sceptics the last days): what is your purpose with a Nomadic Sculpture then? What do you try to say whith this? I answered this question a lot of times and it takes a lot of time to go through it because every answer awakens new questions. The questions go stakkato like a machine gun. And your answers go so too. Some say: if you have to explain it so long this project is not well prepared! But after a lot of questioning i realized that it is impossible to explain this project with a few words. You know why? Because it doesn’t work like an advertising clip. Because it is working completely diverse to postmodern marketing strategies and marketing behaviours. It is based on complete different priorities than the ones we are used to from the very beginning of our lives. We are grown in a material world in which most of us are born as a customer who will work hard to achive a pseudomaterial standardized exchange medium which we all call money. And with this money (which mostly contains of 0’s and 1’s on a digital bank account) we will make our living. It needs a fundamental change of my long-term-trained peronal values to accept this project not only as a funny kids game but to accept it as a project that could be a small part of a soft reformation which can work on a long term to really change the small-term values we all are forced to live in. That’s the moment it get’s funny though. And that’s why we do this! We want to have fun for the achievement of which we don’t have finance huge redundant ecosystems! We want to see the urban landscape from different angles. We want to investigate our urban and social environment. Depending on my cultural background, my age, my social background i could have various desires. As a kid grown up in a postmodern urban society i could have the desire to be dressed real cool, to own one or more skateboards, listen to indie music and go skateboarding with my friends. This could define my identity. If sometime in the future a young kid in the well developed western world can do all these things without thinking primarily about money, then we can say that the Nomadic Sculpture has reached it’s goal. Kids in other parts of the world “can not even think about money” because their parents never had money. They have to improvise with the waste around them and build their toys out of it. That’s why it’s strange when you have all opportunities but you although built a skateable sculpture out of orban trash. Now that’s the reason why our sculpture looks a bis displaced – just a strange piece of art placed on wasted urban space which enables a lot of fun and produces question marks in the minds and the hearts of the people. Above you saw the video clip that our friend Mehmet Birinci has made during our Episode II on Candidplatz in Munich from 26’th to 29’th of june. We had the pleasure to welcome Almir Jusovic from Slovenia as a artist in residency who represents a group of skateboard artists who try to go new ways in riding a skateboard. Almir is also a sculptor and producer of creative objects made out of waste material. Candidplatz is a rather undifined place containing a basketball court and a skatepark. The least is nearly unusable due to the bad conditions of the ground. This place is mostly used by the inhabitants of the area in order to pass throug on the way to the nearby metro station. We changed the athmosphere of this urban wasteland for a few days but it was too short. “Such things should happen more often here” was a quote we heared often from passers by. Episode III of the Art Action will take place from September 11 to 13! The third spot, Willy-Brand-Platz, is strongly influenced by shopping opportunities in the nearby “Riem Arcaden”. That’s why our WTD-Team created something special: The WTD-Container turns into a showroom for re- and upcycled products (fashion & jewelery). 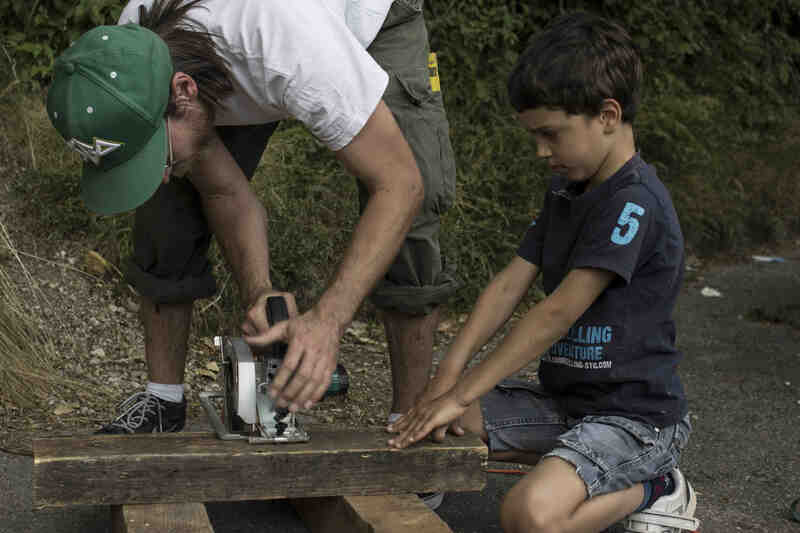 There will also be skateworkshops, a flea market for skate-stuff and a best-trick session. 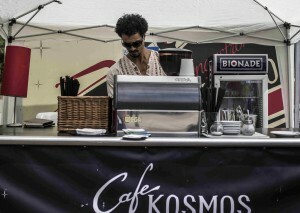 Concerts and DJs will provide musical entertainment and “Café Kosmos” will take care of food and drinks. We are really looking forward to use and revitalize this place to create the current event! As part of the “What’s the deal?” project a mobile, modular sculpture from recycled material is developing and wandering in several episodes through the city: the “Nomadic Sculpture”. Every place gives the sculpture a different shape. As such, the “nomadic hike” is part of the artistic work. 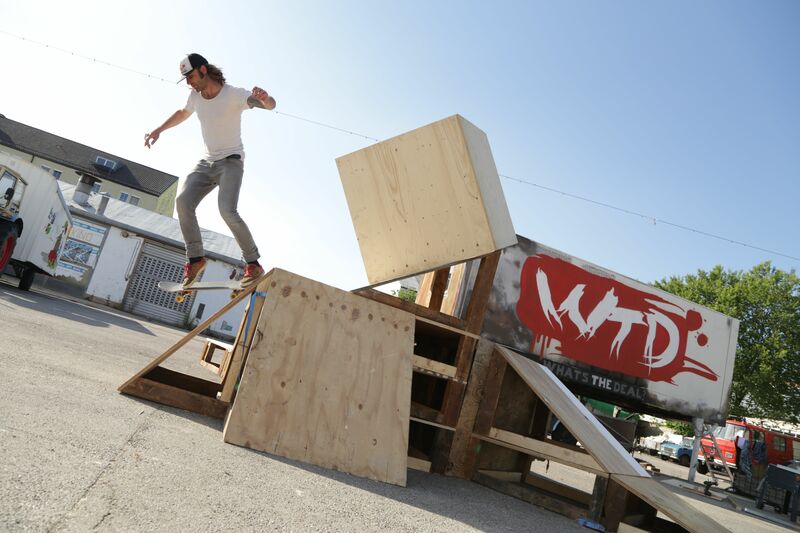 It shows, in a creative and playful way, one version of urban mapping in the skateboard scene. The skate-ability was first tested in Episode II on Candidplatz from June 26 – 29. So now you get again the chance to test the sculpture at Willy-Brandt-Platz. We are excited how you like the transformation of the sculpture. So join us – daily from 12:00 to 20:00 at Willy-Brandt-Platz – and be part of the artwork. Preannouncement: The next event – Episode IV – is to last for nearly 2 months and will take place at the “Maximiliansforum” from November 22 – January 10. Even though the e-zine has already been published in April 2014, its content is still amazing and interesting to read. Have you ever looked at Munich from the perspective of the skateboarder scene? There should certainly be a second booklet to continue the story. 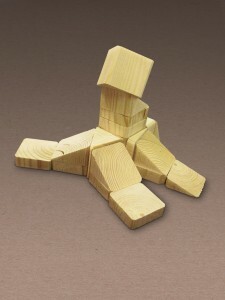 The Munich WTD has worked hard during the last weeks to build the nomadic sculpture. Almost all material used (wooden boards as well as hinges) are the remains of a torn-down building. Here are first impressions of what the sculpture will or could look like at the upcoming event at Candidplatz in Munich. Kilian Gerle from the team is testing the skateability. 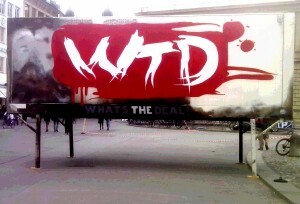 The Munich WTD-team has not remained idle since the last event at Max-Joseph-Platz in April (http://whatsthedeal.eu/blog/?p=276). On the contrary: Philip, Matt, Kilian, Tuncay and the rest of the crew have been busy with planning the construction of the nomadic sculpture. Miniature models of the nomadic sculpture were built to test what the modules should look like, how they could be constructed out of reused wood (from a torn-down roof – but this is another story) and other recycling material, and how they could be combined to make it a skateable sculpture. Mails and comments went forward and backward between the crew members, until the concept was finalized. Quite some effort! But also combined with fun. And now is the time to build the first modules, as only 2 weeks are left before the first public appearance of the sculpture. 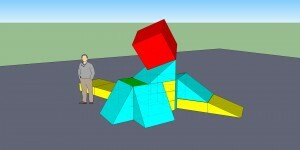 All available hands will be needed to build and construct the modules necessary for the sculpture’s first variation. 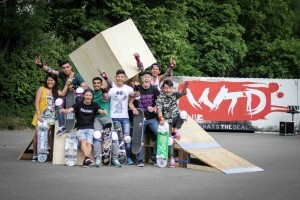 Help will also come from the skater artist Almir Jusovic from Ljubljana who is doing a one-month residency at the Ebenböckhaus and is ready to connect to WTD. 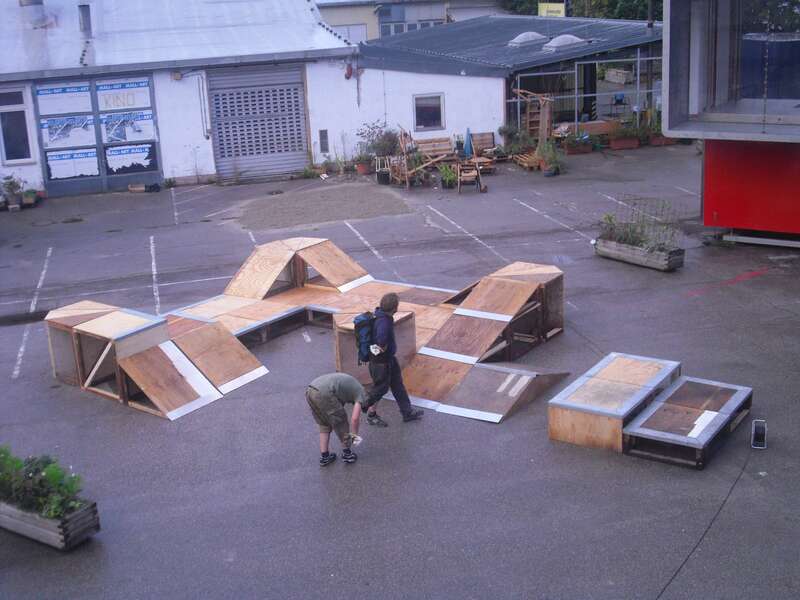 The Nomadic Sculpture will not only be presented from June 26 to June 29 during Episode II: The Arrival of the Modules at the Candidplatz in Munich, but will be ready to be used as skateable obstacle. Let’s see who will dare to do so. Moreover, the local initiatives “Kulturjurte München”, “update. jung & erwachsen” of the Munich City Library and “HIGH FIVE e.V.” together with “SchlaU-Schule” have joined forces with the WTD-team to create and offer a diversified cultural programme on young urban cultures and sustainability during those 4 days. Have a look at the programme (in German). Tausch dich glücklich: Kleidertausch am Candidplatz als Statement gegen Überkonsum. Mitgebracht werden können gut erhaltene und gewaschene Kleidungsstücke aller Art sowie Schuhe und Accessoires (mindestens ein Teil !). Keine Anmeldung erforderlich. Frisch angekommen aus Südamerika tragen die beiden Singer/Songwriter ihr vielsprachiges und musikalisch vielseitiges Programm vor. And not to forget the WTD-Container which is not only the storage space for the sculpture but also one of the venues. Let’s hope the weather will join forces with us for an interesting event. By the way: After Episode II, the Nomadic Sculpture will continue to develop and move on its „nomadic hike“ through Munich being customized to its environment at each stop. More to come! Stay tuned! by Tuncay Filed under: Munich,Nomadic SculptureComments Off on What happened at Max-Joseph-Platz? That’s just one of a bunch of questions that come to one’s mind by hearing the impressive name of this square which is located very near to the city center of Munich? What happened here once? What is happening here now? Who is the guy sitting on top of this massive base greeting the public dressed in a royal gown? It must be an important historical person! As a tourist i could pass it by take some pictures of the monumental buildings in the back (State Opera, National Theater, Royal Residence etc.) and go on with the journey. It seems to be a representative place in the City Center – similar to a lot of central squares all around the world. Well, to be honest: it was this kind of stereotype image that made us choose this square for Episode 1 of Nomadic Sculpture. First of all it was an amazing fact, that nearly no one in the team new the name of the square although most of them were all native born Monacians. This shows that it’s massive representative monumental structure doesn’t really reach it’s goal. This leads us to the next question: What is the main function of this place? At the moment it seems rather to be a huge square the people just pass by on their way to the theater. Just a few people step on the central square. Mainly tourists, less natives. For years the smooth surface of the approach roads around the monumental square made this place a beloved skatespot, but of course this is forbidden. Instead billion tons of high class expensive cars are using them to reach into the save underground car park which is situated right under the square. So we found it quite interesting to start our Nomadic Sculpture project here. And while we already decided to start Episode 1 with a public interview the idea was likely to start this series of interviews right here. We wanted to start Episode 1 by asking specific questions to the public, in order to gather input and ideas for our whole project from the people. So we decided to do it like the big marketing agencies: “we want to get as much information about the individual as we can get!”. To achieve this we put interview teams together which we recruited out of the cities scholars-essembly – charming and clever youngsters who led the people through the interview process. Now it was time for our question marks (http://whatsthedeal.eu/blog/?p=219). We positioned them on 3 different places on the square in order to make questions visible before they were even asked – just as a visualization of a potential need for them. And it worked out fine! It seemed like this visualization inspired the people to ask. So they came and asked curious questions and so we could answer their questions with our own ones! That was fun! The main purpose was to get as much participants for the interviews as possible. For this we built up a set of activities to receive public attention. We built up a bar, a sound system with good music from local bands and dj’s , positioned our container which served as a art workshop and a cinema in the evenings. Our interview teams then started to pick up the curious passers by to involve them charmingly into the interviews. 1. The identity and it’s relations to certain products. 2. The personal habits concerning upcycling, recycling of personal belongings. 3. The most important: questions about the personal relation to this specific public space, the very very private and personal visions and wishes one has concerning the usage of this place. We asked the question: “Look, a skateboarders dream about this place would be this. what would be yours?”. And of course we asked them, whether they know the name of this place and about the identity of the guy depicted in the huge central monument. Well first of all i will quench your thurst about this central question: the guy depicted here is “Maximilian I. Maria Michael Johann Baptist Franz de Paula Joseph Kaspar Ignatius Nepomuk” (* 27. Mai 1756 in Schwetzingen / Mannheim; † 13’th October 1825 in Munich), King of Bavaria from 1805 to 1813. Well the most surprising fact was: most of the interviewpartners neither knew that guy nor the name of the square although a lot of them declared to pass this place frequently (most of them were Munich residents and a few of them were regular visitors of the national opera). At least this showed us that the question marks were well placed here. As we explained in the article before, we plan to include all the input we received from the people (total amount of interviews done: around 100) into the further development of our project “Nomadic Sculpture” and “From Space to Place to Utopia”. But first of all we wanted act differently like all the marketing agencies by giving something back to the people who invested time and energy to answer all that questions. The interview forms were brought to our artists who created quickly done “personal giveaway artwork” for every filled interview form – and those individual artwork we handed out to all the participants (they will be worth a fortune after a few years!). To have a better view please go to our Flickr-page! Artists who produced the artwork: Rosanna Schumacher (http://www.mitrosa.de/), Serena Ferrario (http://www.serenaferrario.de/), Steffi Müller & Klaus Dietl (http://www.ragtreasure.de/), Cordula Schieri. Now what did we do with all the trash wood? First of all we thought a lot. To own loads of woodblocks which costed nothing makes you think a lot. What did we think about? We thought about our sculpture. 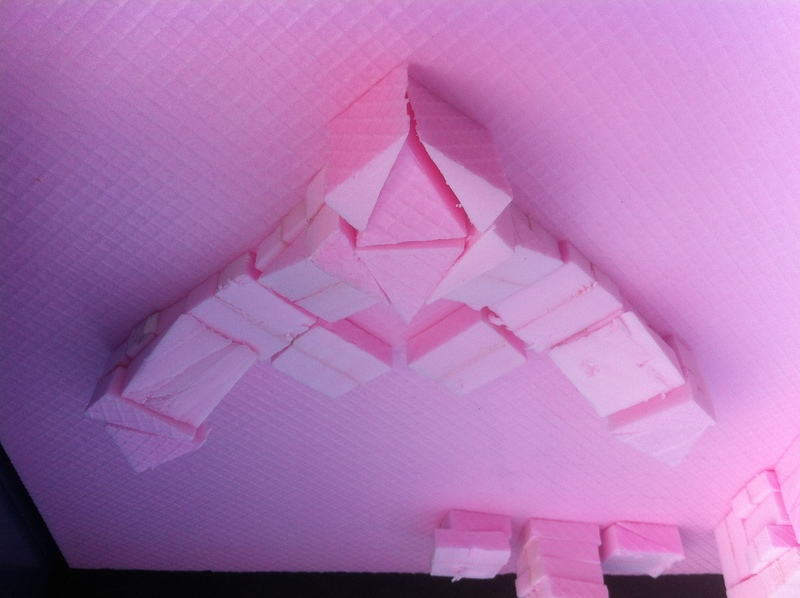 As you could see in our first posts we spent a lot of time on the planning of the modules of the sculpture (http://whatsthedeal.eu/blog/?p=99). But now it came to the action. 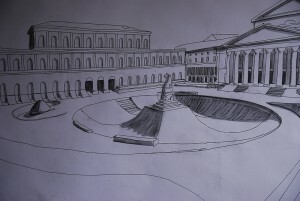 The first episode of our project went closer and we decided not to have all the modules of the sculpture complete yet. Why? Because we want it to be organic. We want to develop by itself. It shall grow part by part and adapt itself to it’s environment. The first spot is in the city center – a very highly frequented place. Why not using this spot to gather some input for the further development? Yes! We want to ask questions to the public! How do people see their environment? Do they know where they are? Do they know something about the place they step on? Do they relate to it? How do they act and move in urban space? Do they wish something special on this certain place? Do they have a personal view on it? Do they have an own claim to it? We want to ask them such things. And lot more. So we can use those inputs for the further development of our sculpture. So what are we going to? From 10’th till 12’th of April we will examine our first event called “Nomadic Sculpture Episode I: the 3 question marks”. Creatives and artists from our network will use the container as a production workshop. The team consists of: Rosanna Schumacher, Serena Ferrario,Klaus Dietl and Stephanie Müller (Slittergruppe). They will produce small artwork in which they will include all the input that the passers by provide us during the question process. The 3 question marks will serve as stations to mark the different stages and the different question topics. Teams of helpers will guide the people through the questions and at the end the participiant will get a artfull present for all his/her efforts. Live bands, dj’s, performances, movie screenings will accomplish the programm of the e days. Meanwhile we will work on the modules of the sculpture and try them out with local skateboarders. A bar organized by the team of Munich’s top bistro Bonvaleur will help us to keep fresh and loungy. What the heck is a Nomadic Sculpture? by Tuncay Filed under: Munich,Nomadic Sculpture,Project ReportsComments Off on What the heck is a Nomadic Sculpture? I just wanted to say hello to you about “What’s the deal?” and of course tell you a story. In Munich we formed the local team and are just working on the plans of our Nomadic Sculpture as you can see. “We” are: Matt, Kilian, Philip, Mixen, Kiesi, Raphaela, Marlen and Marcus. But there are also a few other guys who support us. Well what do we mean with a Nomadic Sculpture? A transportable, but not “branded”, skateable sculpture made out of recycled material. To dispose a mobile and skateable scuplture in open space, we will pick out 5 spots in different locations in Munich. To choose the right spots, certain facts like size, location, and the “potential of being a spot” through the eyes of skaters are basic elements. The object is going to be called “Nomadic Sculpture” and will be assembled at the implied spots. The whole process will begin in spring 2014. The sculpture will change its location monthly including 4 days of installation/dismantling. By selecting the materials, we will put our focus on recycled and used materials. The sculpture is not a fixed huge komplex structure, but more likely consisting out of many singular modules which can be combined with each other. An overseas container is the important part of the project. We will be able to store the modules and all our necessities in it while they are not used. On the other half the container will serve as a eventspace during the active project phases. Ideally, the nomadic sculpture will overwinter in an open space, where skaters can use it as a temporary alternative to a public skate hall. At the moment we are in contact with the Darwin Project in Bordeaux which is interested to act as a host for our sculpture during the winter. In 2015 (May or June), the Nomadic Sculpture is going to be a component of the final event of the project which is planned to be placed in the designated “creative quarter”. Throughout the tour within the city, the sculpture will be developed further and further and customized to its environment. On our first stage – Max-Josephs-Platz in the city center in Munich (April 2014) we will simply arrange an information- and an enquiry desk. All stations will be supplied with a stand-up display in form of a question mark. The question mark is supposed to be the graphic key-element of the whole project and should serve as a symbol for the project which will appear in a large-sized manner. The symbol is intended to question the urban spaces – in which we remain in our everyday lives – in its functionality. In this case the question marks indicate the locations in the sense of an eclectic urban sensation, which can be considered and used differently by every individual (e.g. a step, a stair-rail, a bench etc.). The question, which now will be asked to the pedestrians, is: “Here, a skater would do the following. What would you choose to do with this space? With these collections of answers and ideas we will have numerous possibilities of usage for certain urban areas, which will play a major roll of the entire project in Munich. So, the work of art is not only the sculpture, but also contains the entire process of the “nomadic hike” through the city, which will be provided by content discourse and an agile cultural framework program. We will try to find a spot for the last location, where the sculpture can stay the whole winter. In the skate scene logos are omnipresent: the brands court for attention and the sponsor logos are printed onto ramps and skate parks. To break through this labeling, we will paint the skateable sculpture plain white without branding it nor to supply it with fictitious logos. Skate shows, workshops and a cultural framework program will make sure, that the attention of the subject matter of an urban waste land is drawn to a broad public. 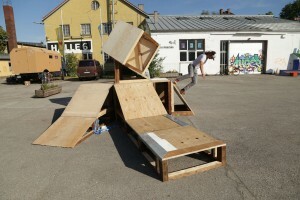 The mobile artwork will be displayed at a variety of unused public spaces in Munich. In the first step we are planning the actions on Max-Joseph-Platz. Kilian Gerle, Max Häring, Tuncay Acar and Matt Wiegele figure out the constructions. How to find material for our Nomadic Sculpture according to our philosophy? We will find it at the trashyards of our hard consuming society! For this we ask fairconstructors etc. who often enough have a lot of material to give away as we could figure it out. We visit fairs and ask people at the stands if they can offer us some parts of their temporary constructions. And of course we visited the ISPO (international main exhibition for sport business) in Munich and were quite surprised. Are brands acting sustainable in the means of reusing stand structures ? Hey – what do you think? Of course they do!!! First of all we have to say, that many brands who presented themselves already started to fit to our philosophy. 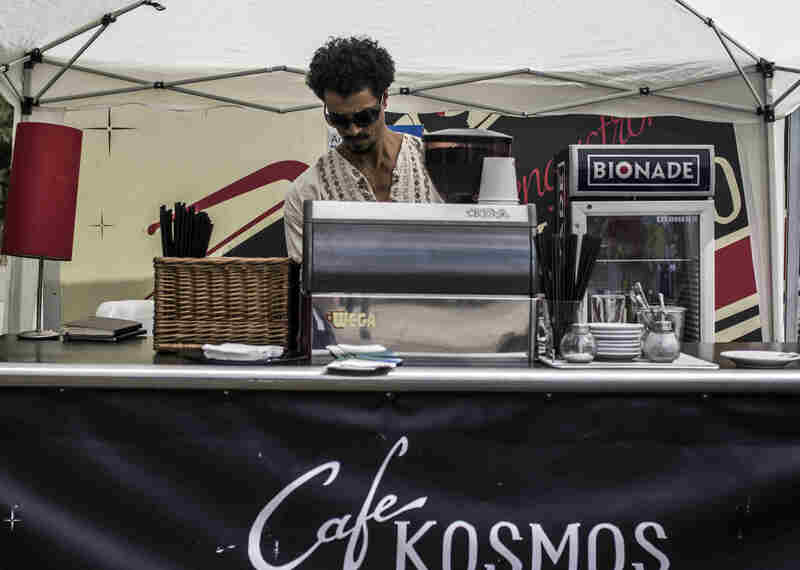 Not less stands were built with used material – for example euro palettes and reused chipboards etc.. A lot of the stand workers we asked at least “told” us that they could give us nothing because they reuse all of the material. That sounded surprising but we liked that attitude! (of course we found a lot more usable trash than we could take with our small bus at the end – but that’s another story, hehe). Are brands acting sustainable in the means of business policies? Another fact which drew our attention was, that ISPO Munich was of course already dealing with the issue of sustainability in many ways. There was a huge area at the fairground which was preserved for two organizations which are working for ISPO to deal with the issue of sustainable production. “Greenroomvoice” is a organization which developed methods of the established textile industry and brings them into the production world of young fashion brands in the urban sports field. Greenroomvoice works on a certificate for sustainable production. “Brands For Good” is – as far we could figure it out working as a consulting company for young brands who want to act sustainable. They care for a effective network and supply them with recent information flow for their work. We talked to Anna Rodewald of Greenroomvoice, who told us that ISPO Munich deals with this issue since 2008. Anna has worked for years in the textile industry and is now working as a independent cunsulter. She organized some of the interesting discussion rounds that were happening at the inspire platform of ISPO. Also it was quite interesting to see, that a lot of brands – especially skateboard and snowboard producers – acted very responsible in choosing natural production material, reusing old material for give aways, finding new ways of production. One brand from portugal for example accuraged his customers to do it themselves by handing them raw modules of the end product and telling them how to put the parts together. Also we met Max Henninger from “Skate Aid” an organization which builds skateramps for NGO’s allover the world, so kids who normally could never afford it can skate also (www.skate-aid.org). We could have spent hours there but we had to find material for our work. And at the end we could have taken tons of trash wood boards with us. I think we will have no problem at all to find enough material for our Nomadic Sculpture…hehe. Well here we store some wooden piles from a deconstructed roof which we took from a construction site. Of course we asked politely and the workers helped us with a crane. In return we gave them a box of good bavarian beer.